Rick Miller is President of RNM Engineering, Inc. and founder of the DALIbyDesign.us website. Dimming of fluorescent lighting offers significant benefits in terms of supporting visual needs with good lighting, giving users control of their own lighting, and energy savings. The advent of digital dimming offers a new option with clear advantages over traditional analog dimming. Digital dimming can be used almost anywhere that analog dimming can be used, for the same purposes: visual needs, personal control, daylight harvesting, scheduling and other control strategies. If fluorescent dimming is desirable for a given application, digital dimming can offer distinct advantages related to intelligence, flexibility and two-way communication. Energy management applications such as scheduled automatic shutoff to meet energy codes, daylight harvesting, due to the ability to more economically set up very small control zones around the daylight aperture, and scheduling via a central computer, which allows load shedding, demand savings and potential utility incentives. Supermarkets, some retail spaces and similar applications with frequent merchandise or layout changes. Small and open offices where users are given dimming control over their own lighting as part of a strategy to increase worker satisfaction. Conference rooms, classrooms, training rooms and similar spaces that require different lighting scenes for multiple types of use. Larger installations with multiple buildings, where feedback on lighting component status can facilitate more efficient lighting maintenance. In any dimming system, the ballasts and controllers must be able to speak and hear the same language. In the case of digital dimming systems, this language is either proprietary—that is, unique to a particular manufacturer and, if allowed, other adopters—or an open standard: the Digital Addressable Lighting Interface (DALI) protocol. DALI, originally part of Europe’s Standard 60929, has been a NEMA Standard (243-2004) in the United States since 2004. When examining whether to use DALI for a fluorescent dimming installation, one must first assess the pros and cons of digital control, and then weigh the pros and cons of DALI as the communication protocol that enables the digital components to talk to each other. In a digital dimming system, a single set of control wires form a low-voltage control bus—sometimes (inappropriately) called a loop. Compatible ballasts and controls (up to a total of 64 devices—with each ballast having its own unique stored address) connect to this bus in order to provide control signal interaction. For larger installations, multiple buses can be networked to proper scale. The control bus provides two-way communication; ballasts can both respond to commands and reply to queries. Control options include centralized systems (a personal computer or building automation system) as well as local controls such as manual dimmers, occupancy sensors and photosensors. 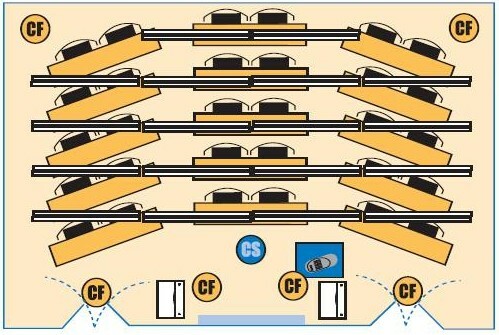 The ballasts and controls connected to the same bus can be assigned to up to 16 layers (groups or zones) of controls and scenes in the same space, and later reconfigured, via programming. A single pair of control wires, which form the bus, connect the ballasts and controls directly, which simplifies wiring in spaces with multiple control zones by reducing the number of homeruns. The level of skilled labor is reduced because there is no need to pull wire according to a zoning schedule. Each ballast on the circuit is wired the same. There are no switch legs or three-way travelers. In addition, dimming control panels/modules are not needed to control light output. Instead, digital systems use a small power supply connected to the bus. Digital ballasts can be wired into the lighting system using Class 1 or Class 2 wiring methods according to the National Electrical Code (NEC). Digital ballasts may use a Class 1-rated 5-conductor cable that uses one hot (live), one neutral, one ground and two polarity-insensitive control wires, all routed together in the same conduit. It is also possible to install the ballasts and controls as a Class 2 installation, in which case the control wires must be routed separate from the power wires. Check with the ballast and controls manufacturers whether their products are rated for Class 1 installation. When configuring a fluorescent dimming system, the designer must specify control zones—that is, a fixture or group of fixtures that are controlled simultaneously by a single controller. For example, in a daylight harvesting scenario with windows, the designer may place lighting circuits parallel to the window, and set up each circuit as a separate control zone. The smaller the control zones, the more granularity, or flexibility, can be achieved, and along with it higher energy savings. But cost also increases. Digital lighting control provides the ultimate in flexibility. 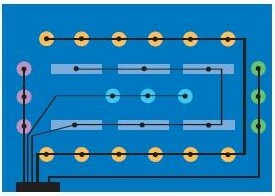 When using analog dimming systems, the smallest zone is a branch circuit. With a digital system, zoning is implemented using software, independent of circuits, using individual ballast addresses stored in memory. 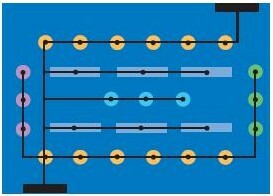 Because each ballast is individually addressable, control zones can be established that are as small as a single ballast or light fixture. Ballasts or fixtures can also be grouped to provide up to 16 layers of controls/scenes. 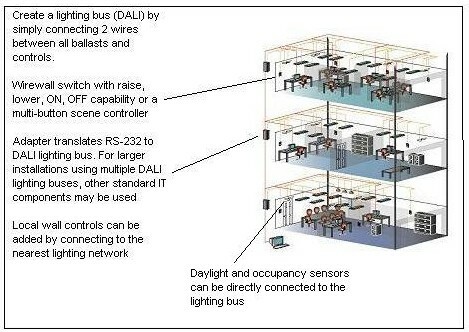 For large installations, individual buses can be networked for the control of hundreds or even thousands of ballasts. Finally, the digital ballast includes a microprocessor that functions as storage (ballast address, intensity settings, fade rate), receiver (control signals) and sender (intensity, lamp/ballast status) of digital info rmation. DALI instructions such as GoToScene and SetMax are sent to the ballasts, utilizing the data stored in its microchip memory. But the ballast is not only “smart,” it can also “talk back.” As the control bus enables two-way communication, the digital ballast can not only receive commands, but respond with maintenance and energy info rmation such as the status of the ballast and lamps. This enables the lighting system operator to query ballasts for energy usage (using feedback such as IntensitySetting), which can be used for a variety of purposes from energy savings verification to benchmarking to billing internal departments or tenants individually for their lighting usage. It also enables the operator to query ballasts for lamp and ballast failure (querying for a response such as BadLamp), which can improve the efficiency of lighting maintenance and improve customer service from the facilities department. Lighting automation is now mandated in most of the United States. With the adoption of the ASHRAE/IES 90.1-1999 model energy code by the U.S. Department of Energy as the minimum national standard, a majority of state energy codes require automatic shut-off of all lighting in commercial buildings larger than 5,000 sq.ft. in size, with few exceptions. Automatic shut-off can be provided by occupancy sensors and programmable time scheduling devices. According to the California Energy Commission, scheduled automatic shutoff can generate 5-15% energy savings. With 0-10VDC dimming, the ballasts are connected with control wires; the controller can dim, but not switch, the lights. To achieve ON/OFF switching, the power wiring would have to be reconnected to match the dimming circuits. With DALI-based digital lighting, any ballast or group of ballasts on the network can be given an ON/OFF or DIM command without rewiring the circuits. This enables compliance with prevailing energy code requirements for automatic shutoff in controlled spaces without the need for a control panel with a scheduling function. The higher level of capabilities from digital control systems often entails tradeoffs in cost and complexity. Digital ballasts and controls typically present a higher component cost largely due to power supply/router requirements, but they can present a lower installed cost due to a reduction in wiring labor for group and scene control, and the removal of the need for dimmer modules/control panels in larger installations. Digital control also presents more sophisticated programming when centralized systems are used, and requires on-site field commissioning, which should be factored into the design specification so that the appropriate party is aware and can bid on this portion of the installation. During the start-up phase, a database of ballast addresses, with physical locations and the control device that operates them, needs to be created and then maintained when the layout of the space changes. It may be advisable to involve the client’s IT staff in the creation and maintenance of the database. Once the designer decides to implement a digital control strategy, a primary choice is whether these devices should communicate using a proprietary protocol or DALI, which is a standard open protocol. The advantage of a proprietary protocol is that the complete control system can be furnished by a single manufacturer, which has tested all components to ensure interoperability and supports the entire system on the job. The disadvantage is that the owner is tied to a single manufacturer, which limits choice and potentially sacrifices economy. DALI is a royalty-free, non-proprietary, two-way, open and interoperable digital protocol and a standard in the United States and Europe (European Standard 60929, NEMA 243-2004). Currently in the U.S., DALI consists of a set of commands to and from ballasts within a defined data structure and specified electrical characteristics. Provides true interchangeability across ballasts and controls. Multiple manufacturers can be involved in a system, instead of being tied to a single supplier, using DALI as an open platform. This can result in lower costs, ensures future availability, and enables the system designer to select product functions from one manufacturer and combine them with products from other manufacturers. Provides standardized ballast performance. For example, DALI defines light output for all levels of dimming signals. DALI ensures consistent dimming performance across all dimming ballasts regardless of type or manufacturer, currently not achievable with analog dimming methods such as 0-10VDC. As an open standard, DALI is supported by five major U.S. electronic ballast manufacturers and a growing number of controls manufacturers, which offer DALI-compatible products. Digital ballasts are available that provide a dimming range of 100% to 1%, utilizing a logarithmic dimming curve. The inverse-square dimming curve is used for better control of the lighting intensity in response to the human perception of brightness. Digital ballasts utilize programmed-start technology to maximize lamp service life, highly suitable for frequently switched applications such as installations with occupancy sensors. DALI based digital control systems can include all controls that would normally be used for multi-scene fluorescent dimming, such as preset controls, as long as they are rated as compatible with DALI. They can be used to operate with a DALI compatible digital ballasts for fluorescent lamp dimming, or a DALI compatible solid-state transformer for precise incandescent lamp dimming in both 120V and 12V versions. Digital controls are also compatible with switching devices such as occupancy sensors and other devices such as photosensors. With a digital control scheme, the designer can implement automation strategies such as scheduled dimming from a central PC for centralized control while enabling occupant control and override via local interfaces such as preset controllers or occupant PCs. The digital lighting network can be connected to a lighting automation or building automation system for integration with other lighting or building systems. For a DALI-based digital control system to communicate with a non-DALI lighting control system, or a BAS operating using another protocol such as BACnet or LonWorks, a translator device, called a gateway, is required to enable these systems to communicate with each other. Below are two applications, a conference room and a lecture hall. 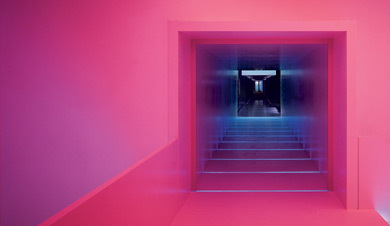 In this space, light levels can be controlled so that the side of the room where presentations occur can receive more or less illumination depending on the media used. Halogen accent lights highlight pictures on two of the walls. The 4-scene wall-mounted controller is used at the entrance. The handheld remote is used for zone programming as well as programming scenes and recall. With 14 light sources in this room, most of them can be established as its own zone for a very high degree of flexiblity and control resolution. 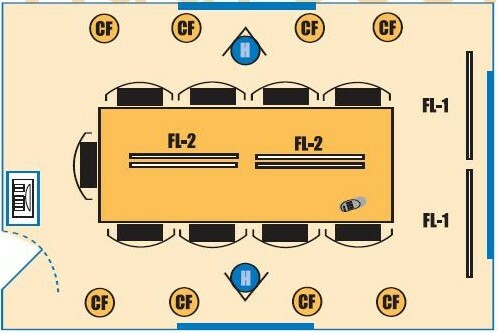 In this space, control zones can be established so that during A/V presentations, the lights near the front of the hall can be dimmed while the lights in the rear can be set at higher levels. A 4-scene handheld remote is used with the ceiling sensor for dimming control. Controls at the doors provide both on/off and up/down control. The programmable remote is used for programming and is then stored only with access to authorized users. Digital dimming is not for all applications, but it offers clear advantages in applications where fluorescent dimming is both well-suited and desired. As demand for fluorescent dimming increases, so will the demand for digital dimming increase as a control method that offers distinct benefits. Digital dimming allows software configuration of lighting groups, presets matching the lighting to the space usage, and integrated energy management functions. Digital systems can be configured as large networked systems requiring commissioning and training, or as simple stand-alone room preset dimming controls requiring no special tools or PCs. As an open standard used with digital systems, DALI enables true interchangeability among vendor products and standardized performance across manufacturers. Although digital systems can present a higher component cost, labor savings resulting from simplified wiring can result in a lower installed cost compared to 0-10VDC dimming. And although digital dimming is new, and a little different, much of the equipment and methods will be familiar to designers and installers of 0-10VDC dimming systems. In several important ways, installation is actually simpler.